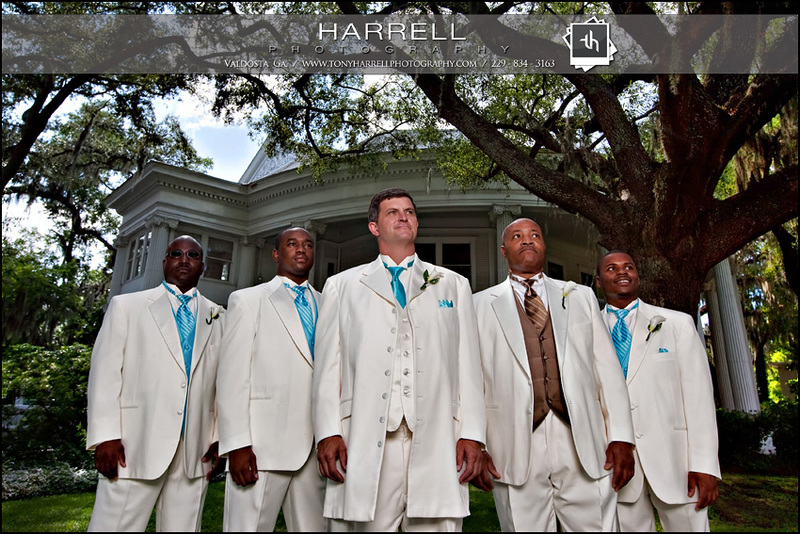 Tanya and Andrew ~ Wedding ~ The Crescent, Valdosta GA.
Hey ~ another Tuesday blog post! Hey ~ another wedding at the Crescent! Kind of spooky, isn’t it? Say hello again to Tanya and Andrew. You might remember them from their engagement session way back in March. These crazy kids got married at the Crescent last week, and Lisa and I were honored to be there to document their ceremony. Let’s get started with the images, eh? The lovely bride Tanya, and ruggedly handsome groom Andrew. It’s like looking at an ad in Vogue folks. Money. Formals are normally a quick and easy process for us… until you unleash Trina on the scene. We finally had to seperate Trina from the others to get her to behave. Here’s proof. Looking fab. We snagged a few more of Tanya’s pals and took portraits of them. Here’s one of Shannon and Ryan. The race down the aisle! With escorts, no less, to rough up the photographers… probably. Meet Ricky – owner of Millennium Smoker. The man has skills. Sure, he kept giving me tidbits of BBQ everytime I walked by ~ but it was out-friggin’ standing. No lie. Highly recommended for your reception catering needs. After some great BBQ – people got down and danced! Mrs. Vera bustin’ out the moves on the dance floor. She was hard to keep up with. The Crescent seems to generate some serious competition during the bouquet toss. A tip-toe grab! It was a blast guys! Your full gallery should be up next week! OH MY GOSH I DO LOOK FAB!!!!! ALL THE PHOTOS LOOK WONDERFUL I LOVE THEM CAN’T WAIT TO SEE THE REST. Everything Looks great, I never thought my sister could get any more gorgeous than she already is! I can’t wait to see the rest! I love the pictures, glad to see that Courtnay had a good time.